Brief, clear, and compelling with a groundbreaking visual approach. Written to answer that all-too-common student question, "Why should I care about economics?" 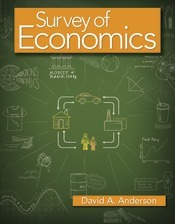 David Anderson’s new Survey of Economics text was written from the ground up for the course rather than being carved out of a traditional Principles text. No other text—in print or online—covers all standard elements of the college survey course with such engaging clarity, brevity, and visual appeal. Anderson highlights the intersections of economics and daily life through a story-based narrative, clear explanations, and memorable images and graphics. The author brings to the book a thoroughly winning narrative voice and a wide range of experience, including almost three decades teaching the survey course, a dozen introductory economics books for a range of audiences, and extensive work with the AP® economics community.